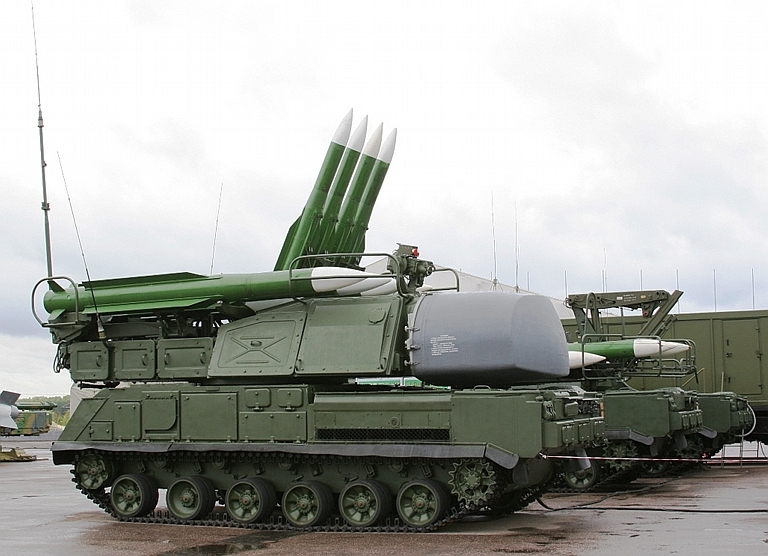 The Buk M2E / SA-17 Grizzly 9A317 TELAR is equipped with the new NIIP 9S36 passive phased array engagement radar, which provides the capability to concurrently track and illuminate multiple targets for the four 9M317 Grizzly SAM rounds. The TELARs are typically each paired with a 9A316 TEL/Transloader. 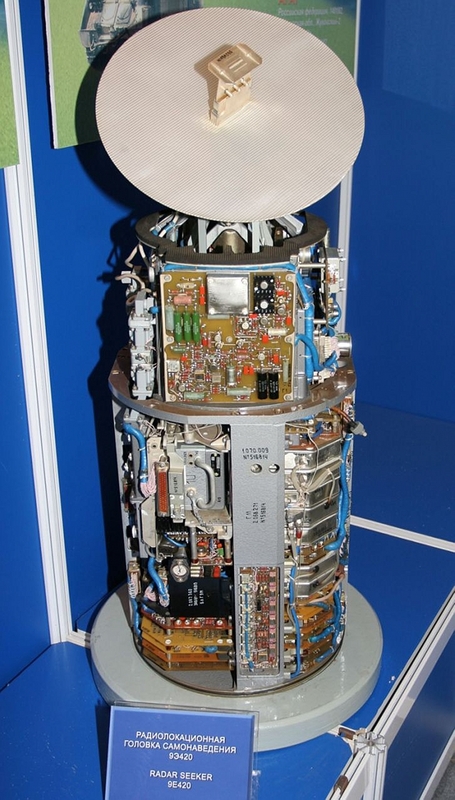 Note the electrooptical tracker above the antenna aperture (image © Miroslav Gyűrösi). 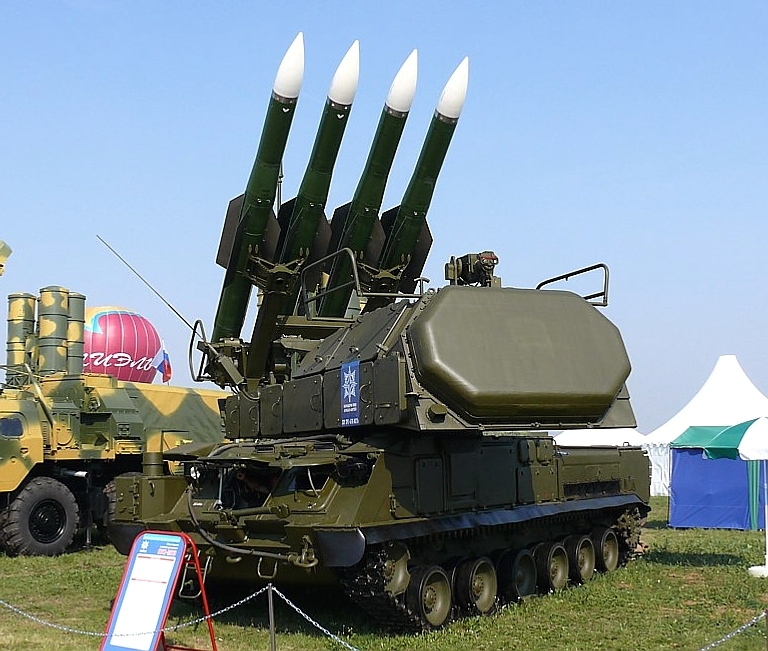 The 9K37 Buk / SA-11 Gadfly was developed to fill two compatible basic requirements, the first being to provide a replacement for the 1960s developed 2K12 Kub / 2K12 / SA-6 Gainful Surface to Air Missile system, the second being the provision of a common missile round for the M-22 Uragan / SA-N-7 Gadfly Surface to Air Missile system for medium sized naval surface combatants. 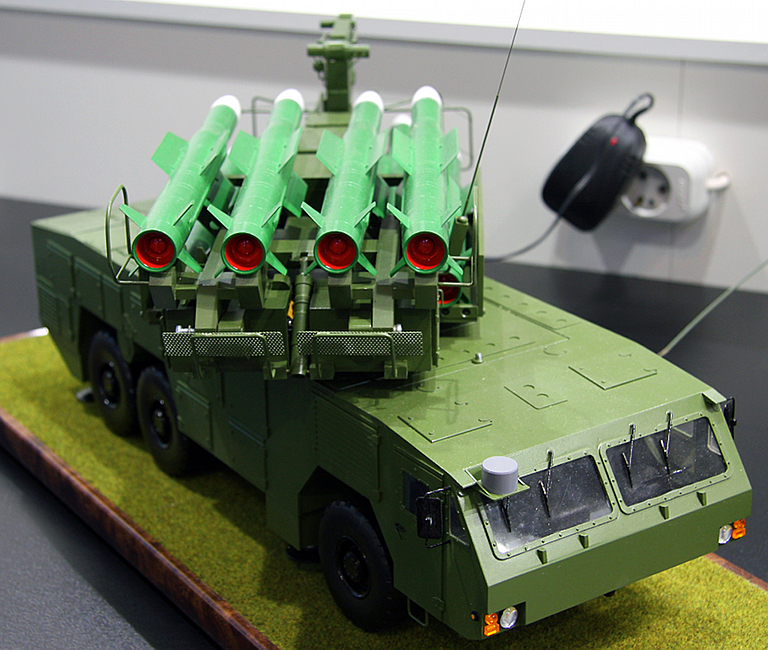 Key design imperatives were to provide a design with a better capability to engage multiple targets compared to the 2K12 / SA-6 Gainful, with an easier to maintain weapon system and missile round, with improved kinematic performance, improved countermeasures resistance, and a capability against 10 to 12G manoevring targets, and TBMs such as the Lance. 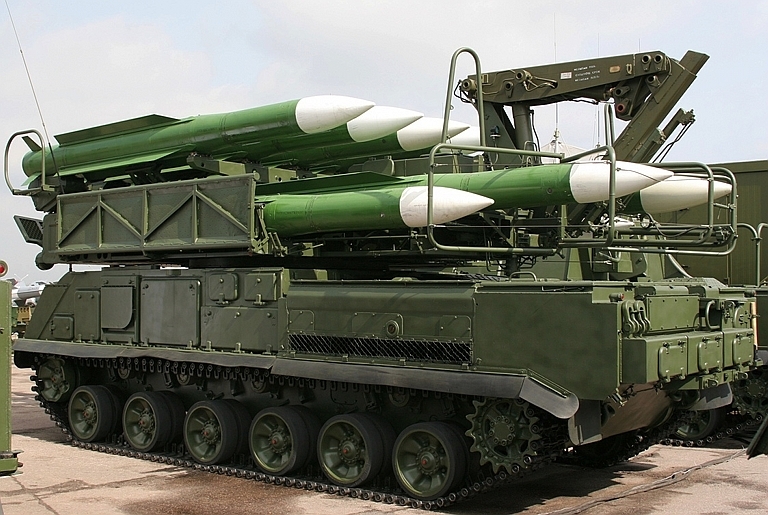 Development was initiated early in 1972, with Tikhomirov NIIP responsible for system design, and Novator, at that stage engaged in the development of the 9M82/9M83 / SA-12 missile round, tasked with developing the new missile. Agat were tasked with developing a new semi-active homing radar seeker. 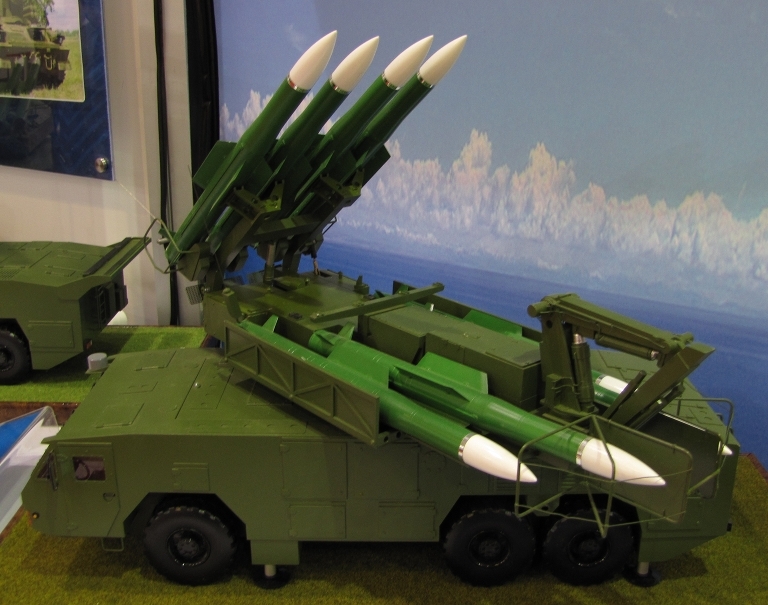 The 2K12M4 Kub M4 was a Gainful variant which was for all intents and purposes a compatible hybrid with the 9K39 Buk / SA-11 Gadfly. Depicted a 9A38 TEL with 9S35 Fire Dome track/illuminate radar and 3M9M3 rounds. 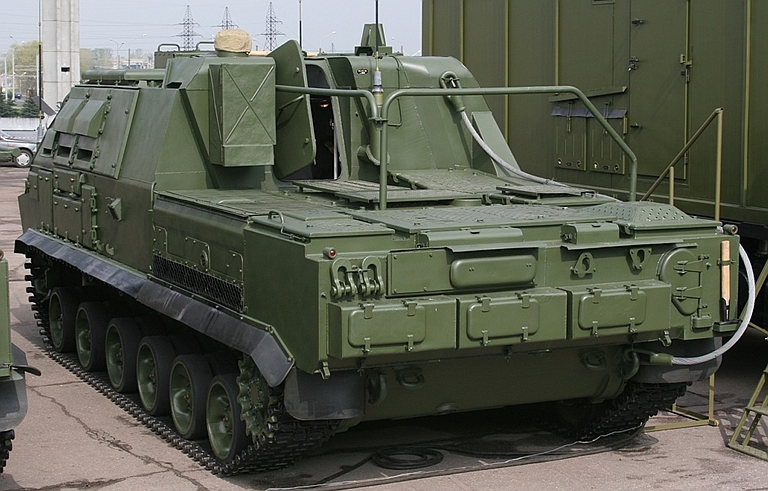 The TELAR can be fitted with either three launch rails for the 3M9M3 or four rails for the 9M38 (RuMoD image). The development process was split into two phases to accelerate the deployment of the new missile and engagement radar, with the hybrid 2K12M4 system using the 1S91 Straight Flush, and a new 9A38 TELAR replacing the 2P25M3. The new design departed fundamentally from the 2K12 / SA-6 Gainful in system configuration, as each TELAR was equipped with a 9S35 Fire Dome engagement radar, which provided tracking and CW illumination for the missile seekers. The newer Metrovagonmash GM-569 series chassis was adopted. This design strategy removed the fundamental bottleneck in the firing rate of the 2K12 / SA-6 Gainful, where every TEL depended on the fine tracking and illumination provided by the 1S91 Straight Flush. 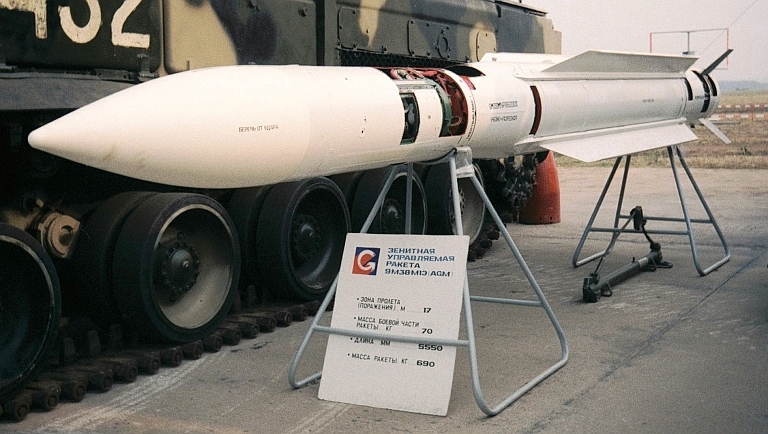 The 2K12M4 hybrid, armed with either 3M9M4 or 9K37-1 missile rounds, would not suffer target saturation in the manner of earlier variants. 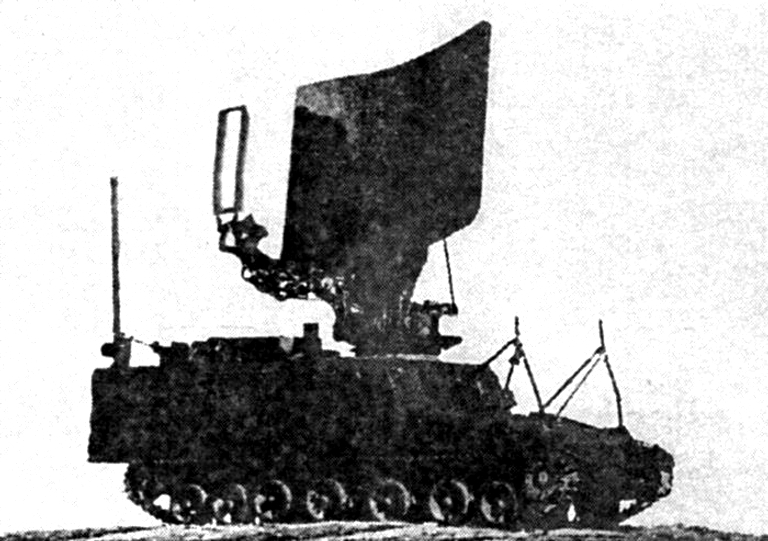 This strategy of using a tracking nd illuminating radar on each TELAR remains unique to Soviet/Russian Army Air Defence SAMs, also used with the S-300V / SA-12 Giant/Gladiator system and its 9A82/9A83 TELARs. the 9S35 Fire Dome illuminator was thus compatible with the 1SB4M missile seeker, and compatible datalink terminals were required. This variant attained IOC in 1978. The cross compatibility between the 9K37 and 2K12 systems continues to be reflected in various contemporary block upgrades which involve the retrofit of 9K37 components into 2K12 systems, including the newer missile rounds. 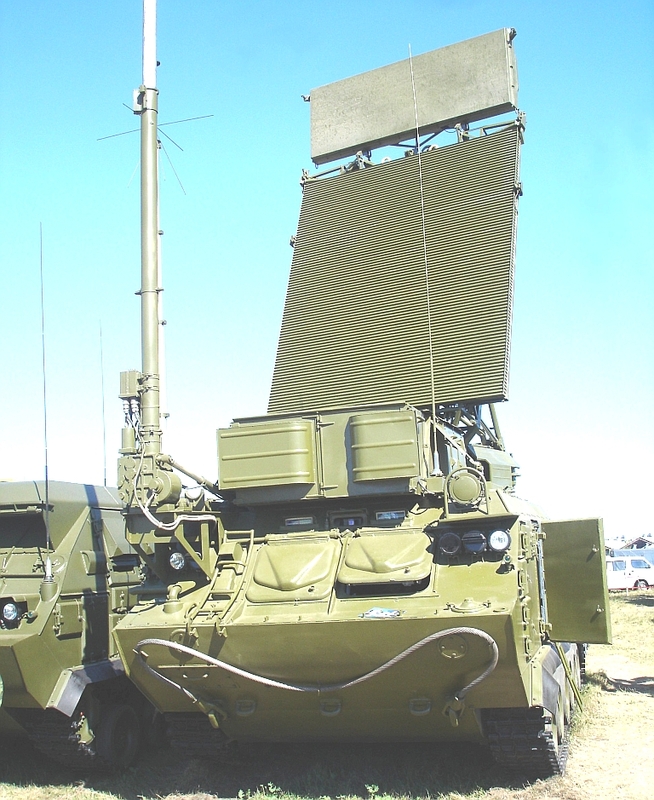 1S18 Kupol / Tube Arm acquisition radar (Vestnik PVO). 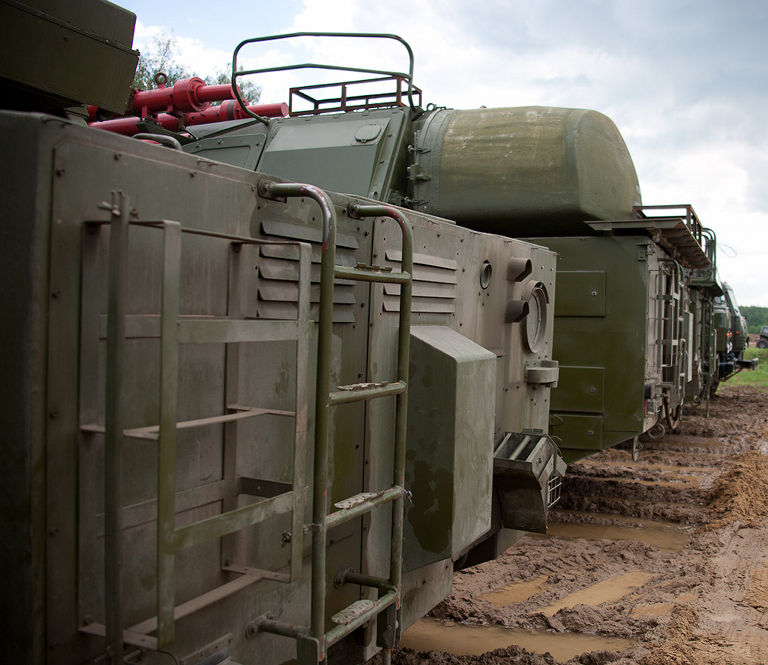 The second phase of the development resulted in the new 9S470 self propelled command post, the 9S18 Kupol / Tube Arm acquisition radar, the 9A39 TELAR, and the 9A310 TEL/transloader designs, forming the new 9K37-1 Buk / SA-11 Gadfly system. 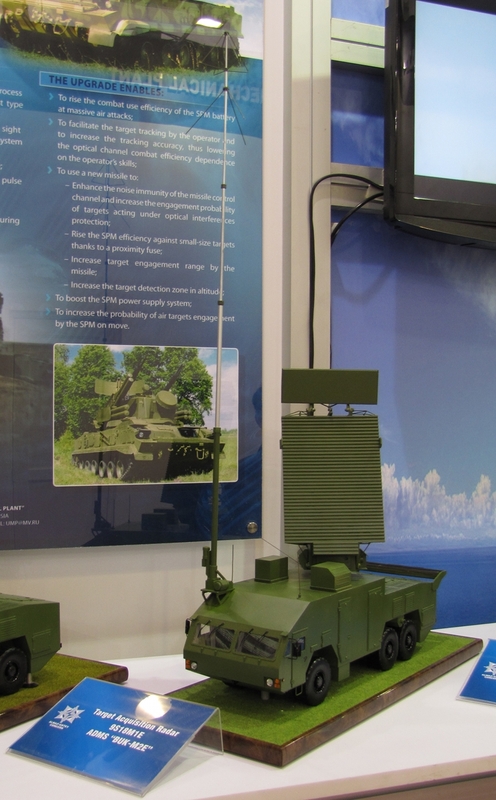 The battery structure was also a departure from the 2K12 model, with the 9S18 Kupol / Tube Arm acquisition radar and 9S470 command post structure much closer in concept to that used in the S-300V / SA-12 with its 9S15 Bill Board acquisition radar and 9S457 command post. All system components were designed, like the S-300V / SA-12, to shoot and scoot in five minutes. IOC was achieved in 1980. While the new system design provided many performance improvements over the 2K12 / SA-6 Gainful, and permitted a greater rate of fire, the system did not perform well against TBMs, anti-radiation missiles, cruise missiles and anti-tank helicopters in hover. Development of the improved 9M37M1 Buk M1 variant commenced in 1979 and IOC was achieved in 1983. The 9M37M1 Buk M1 variant has been exported. The new variant introduced a range of incremental improvements to system components, resulting in the 9S470M1 command post, the 9A310M1 TELAR with improved 9S35M1 Fire Dome and 9Sh38-3 electro-optical tracker, the 9A39M1 TEL/transloader, and the entirely new 9S18M1 Kupol M1 / Snow Drift engagement radar. The Snow Drift was a radical departure from the Tube Arm, and used similar planar array antenna technology to the 9S15 Bill Board series. 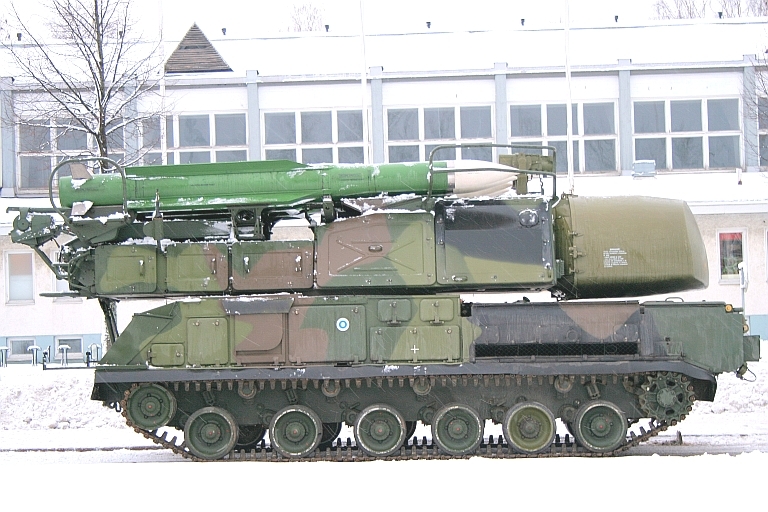 The end of the Cold War saw the 9K37M1 in production, and development of the follow-on 9K37M1-2 Buk M1-2 was initiated during the later 1990s. This variant was intented to expand the target set further, to encompass strategic and tactical aircraft, helicopters in hover, cruise missiles, tactical ballistic missiles, air to surface missiles, precision-guided munitions, maritime surface targets, and high value ground targets. The latter was to include parked aircraft on airfields, missile launchers and command posts. 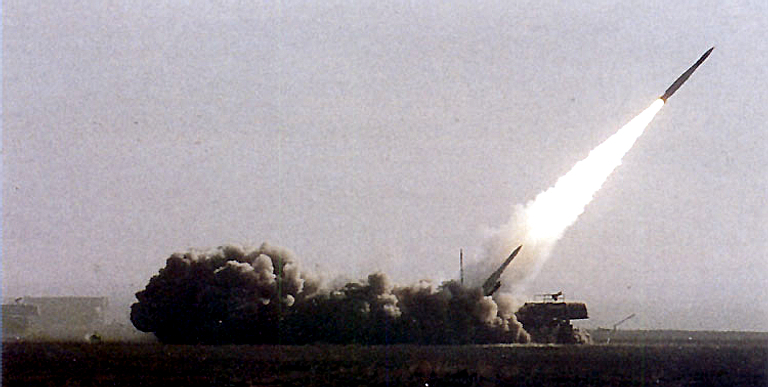 This variant introduced a substantially new missile round design, the 9M317 designed by DNPP. It uses a redesigned semi-active homing seeker using P-nav, a midcourse guidance datalink channel, inertial navigation system, more capable proximity and contact fusing, and a more lethal combined effects warhead. A dual pulse motor is employed. The new missile is described as multirole, due to the range of target types it is intended to kill. It is claimed to be capable to intercepting a 12G target. The most recent variant of this family of weapons is the 9K317 Buk M2 / SA-17 Grizzly, exported as the 9K317E Ural. This variant incorporates some of the most prominent design changes to date. A new 8 round 9A316 TEL/Transloader has been introduced. The new fully autonomous 9A317 TELAR is equipped with a 9S36 passive phased array antenna equipped radar, replacing the mechanically steered antenna in earlier 9S35 Fire Dome equipped TELARs. This is intended to provide the capability to concurrently engage four targets with a single TELAR, and improve countermeasures resistance. A more basic TELAR, the 9A318, is also provided. 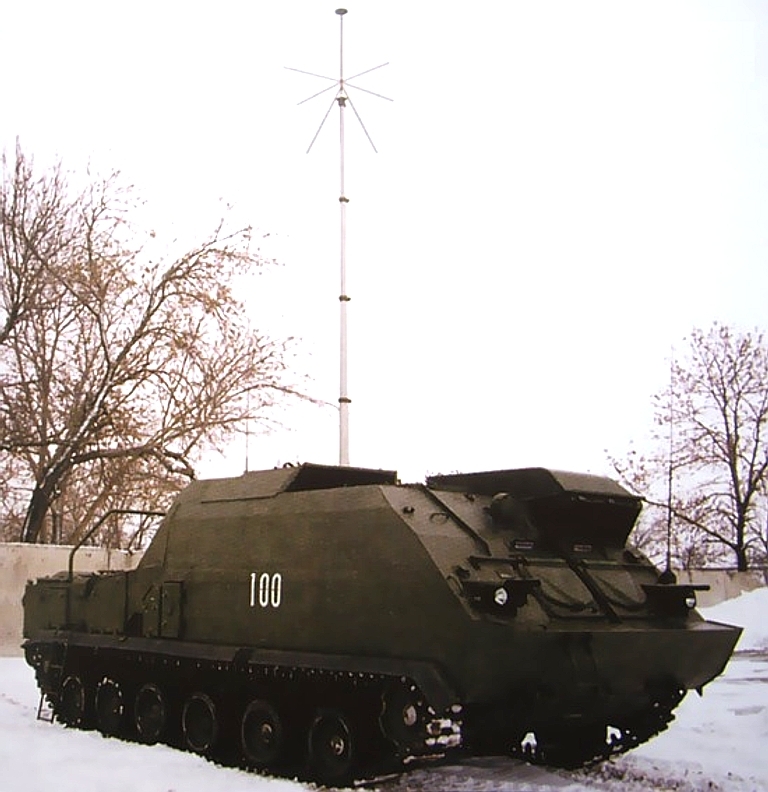 The baseline 9S18M series acquisition radar is replaced by the 9S117 Kupol M2E. 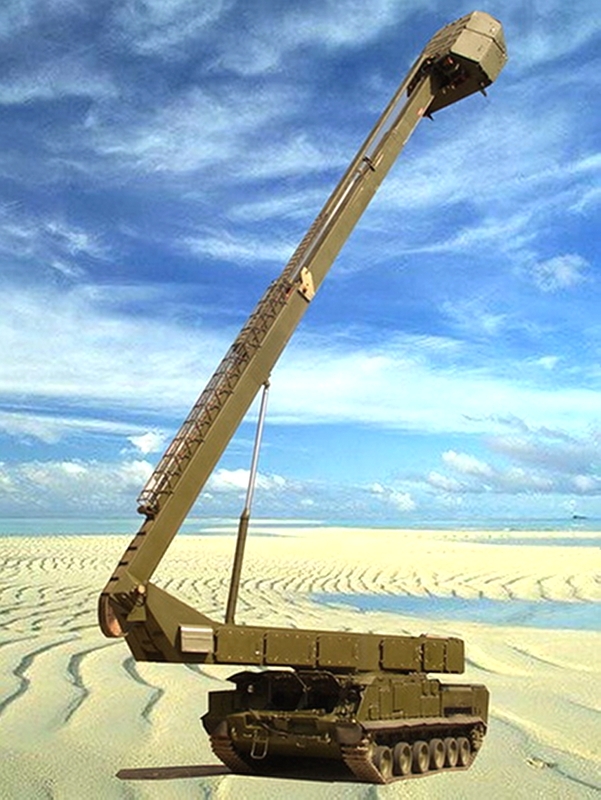 The most interesting component of this design is the standalone mast mounted 9S36 phased array, designed to provide extended low altitude and surface coverage, in air defence but also maritime coastal defence applications. This design uses a 21 metre telescoping and elevating mast which mounts a radar head with the 9S36. 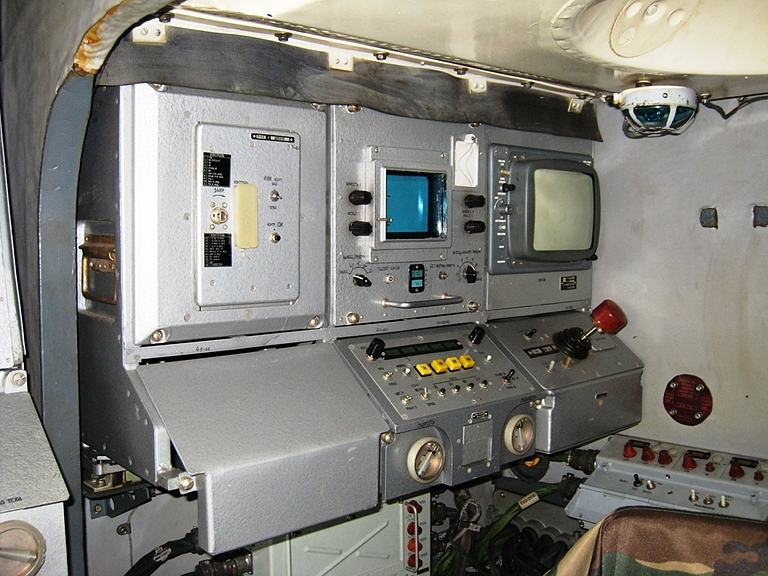 Each mast mounted 9S36 engagement radar controls a pair of 9A316 TEL/Transloaders. 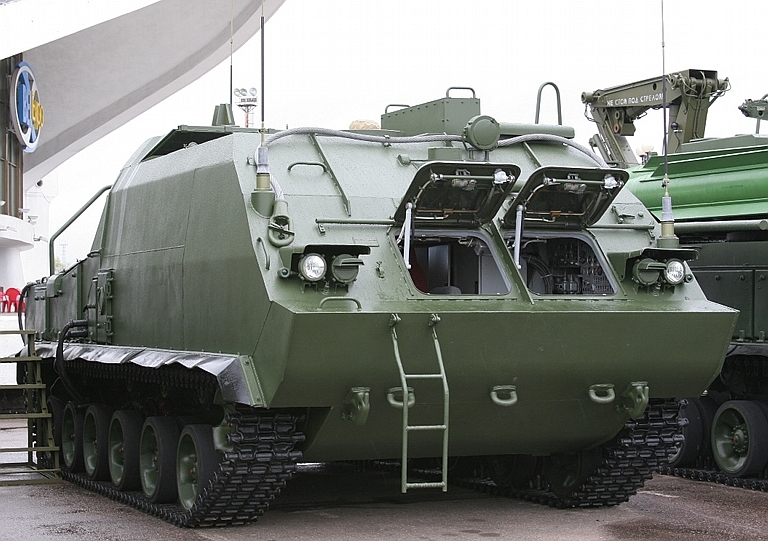 The 9K317 Buk M2/M2E / SA-17 Grizzly is offered on the baseline tracked chassis, but also on the new wheeled 6 x 6 MZKT-6922 TELAR vehicle, in testing through 2010. 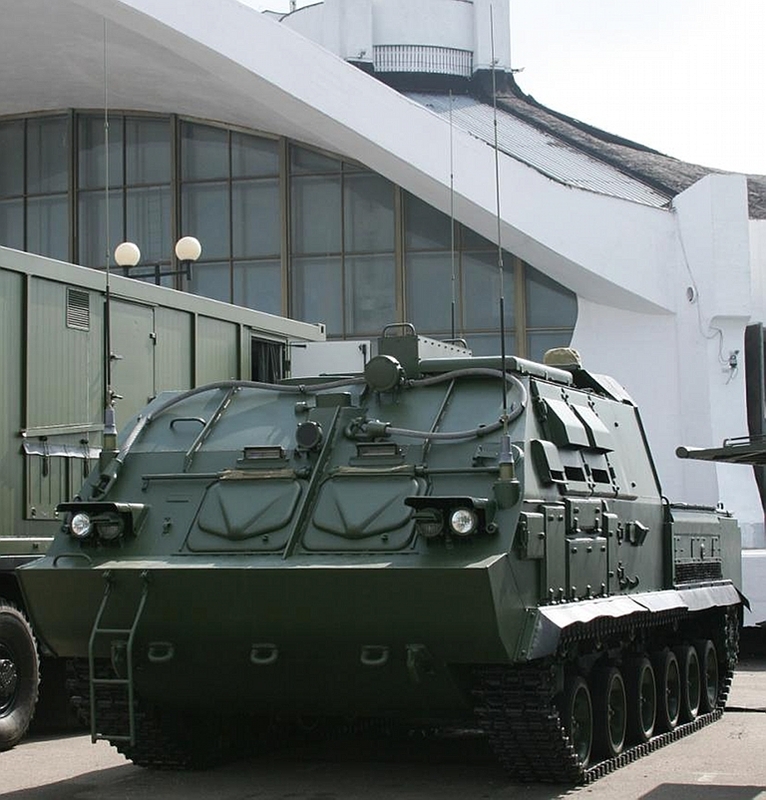 The Belarus integrator Agat, best known for designing command posts, is also offering the 9K39MB Buk MB, a digital block upgrade to the baseline 1980s analogue 9K39 Buk. 9M38M1 Gadfly missile launch (Russian MoD). Left: Agat 9E420 digital CW dual plane monopulse semiactive radar homing seeker for the 9M317 Grizzly missile. 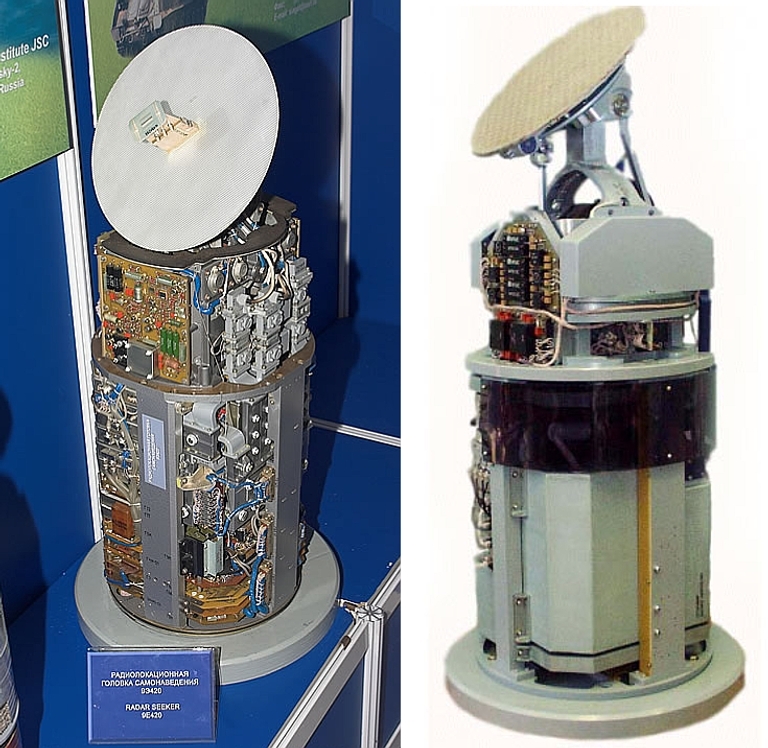 The unique antenna arrangement is inherited from the 3M9 / SA-6 Gainful series seekers (via Missiles.ru); right: Agat ARGS Slanets monopulse active radar homing seeker for the 9M317 Grizzly and 9M38M Gadfly missiles (Agat). Detail of 9E420 SARH seeker, note the polarisation screen over the primary aperture (image © Miroslav Gyűrösi). Novator 9M38M1UR Gadfly cutaway training round. 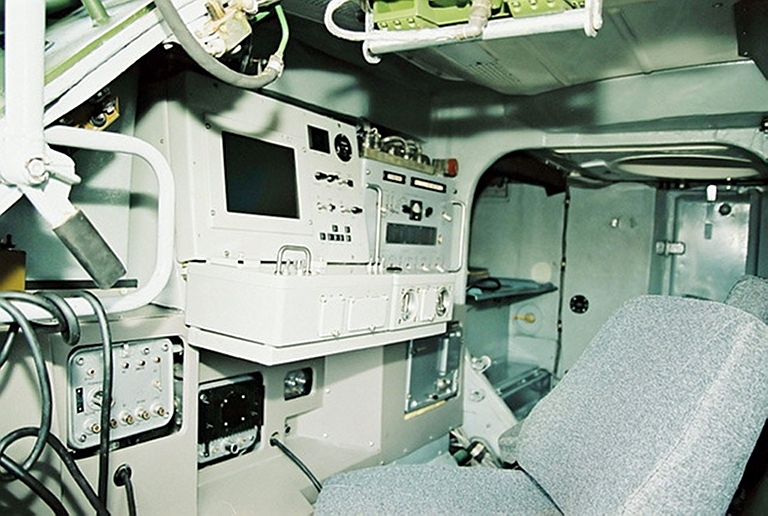 The guidance section and aft control servo sections are exposed (image © Miroslav Gyűrösi). 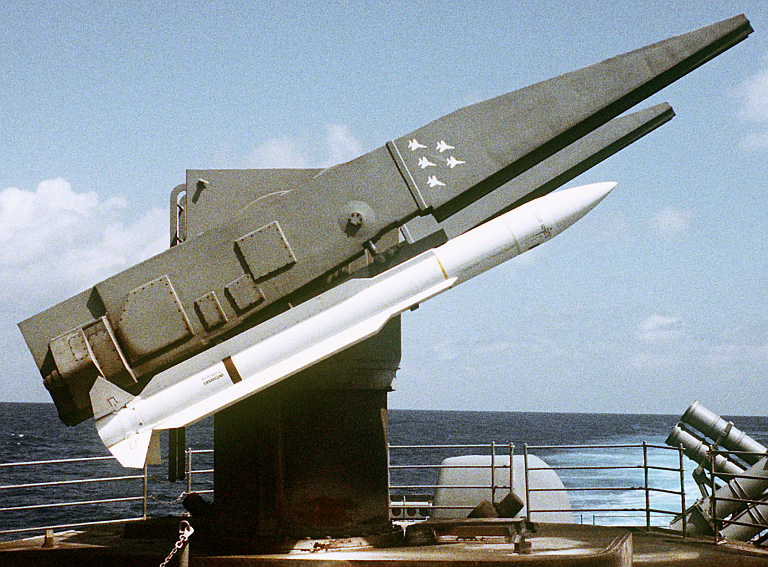 The Novator 9M37-1/9M38/9M38M1 Gadfly and DNPP 9M317E Grizzly missiles are direct equivalents in basic design to the US Raytheon RIM-66 Standard family of naval missiles. The Russian missiles are slightly larger, by 17% in length and in diameter, with all missiles within ~3% of each other in launch weight. Range performance of the Russian missiles is similar to the RIM-66B, and lesser than the RIM-66C, although this may in part reflect control laws employed. 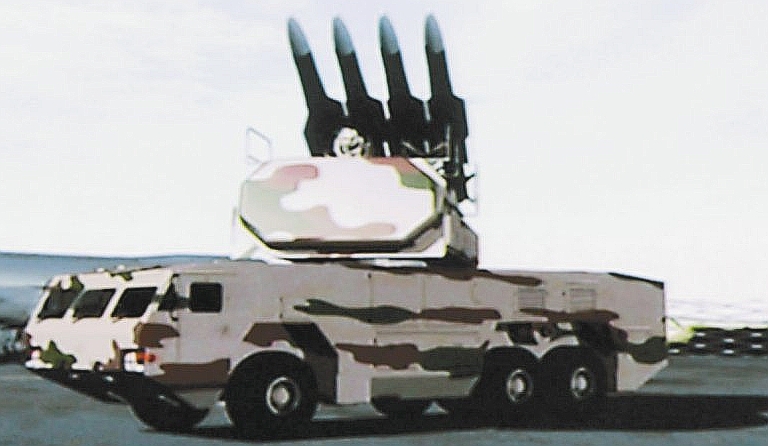 The 9M317E Grizzly missile employs a very different, higher span and shorter chord configuration, cruciform wing design compared to the earlier missiles. As this weapon remains in production, detailed materials on its internal configuration and design features are generally scarce. 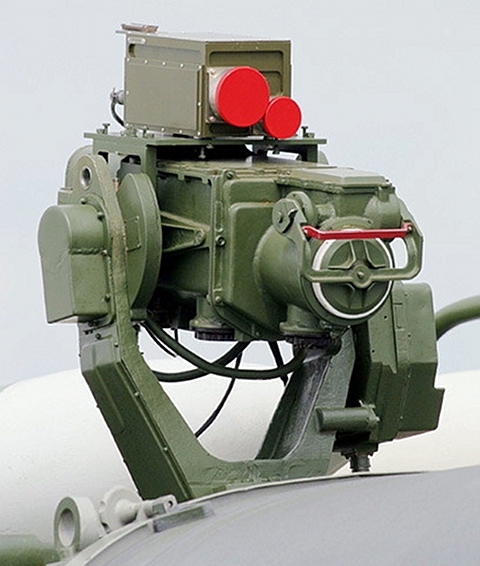 The nose of the missile mounts the monopulse semiactive radar homing seeker under a dielectric radome. In the 9M37-1 missile the seeker is a 9E47 Virazh, in the 9M37M a 9E47M, the 9M38 a 9E50, and the 9M38M1 a 9E50M1. The new 9M317 missile uses the digital 9E420 seeker. The antenna configuration of the latter appears virtually identical to the 1SB4M seeker in the late model 3M9M3 Gainful missile. 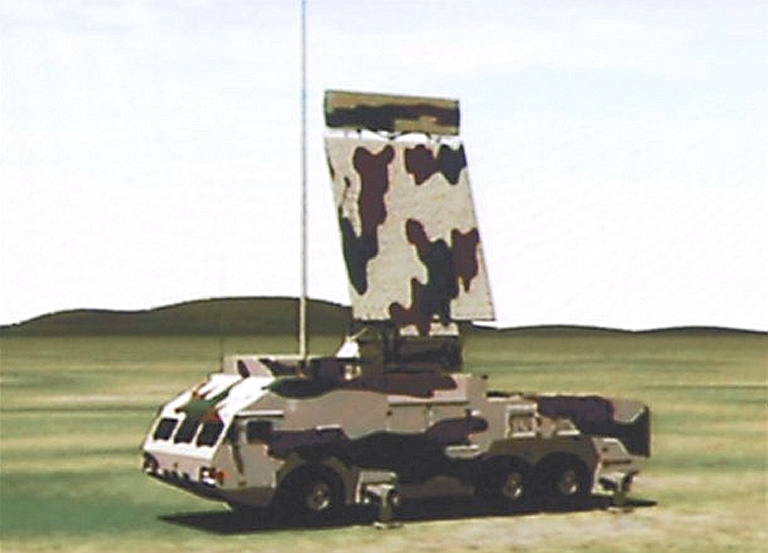 Agat have also offered the ARGS Slanets monopulse active radar homing seeker for all Buk family missiles. This 35 kg digital design has a 270 mm diameter planar array aperture and is claimed to be capable of acquiring a 5 m2 target at 70 km [Agat Missile Seekers]. Details of the missile proximity fuses and warheads, datalinks, autopilots and solid rocket motors have not been disclosed to date. US Navy RIM-66C MR SM-2 Standard SAM. Mass 708 kg, Length 4.72 m, Diameter 0.343 m, Range ~40 nautical miles (US DoD). 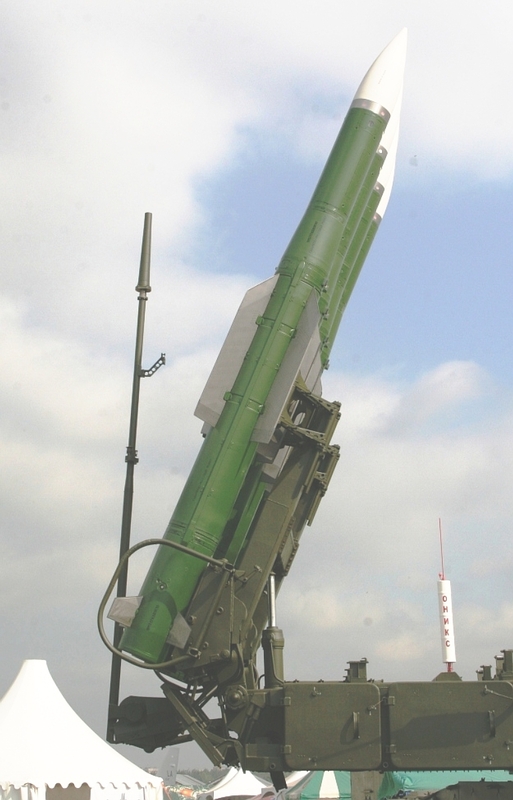 Novator 9M38M1 Buk M1 Gadfly SAM. Mass 685 kg, Length 5.55 m, Diameter 0.4 m, Range ~19 nautical miles (Wikipedia image by Olli-Jukka Paloneva). 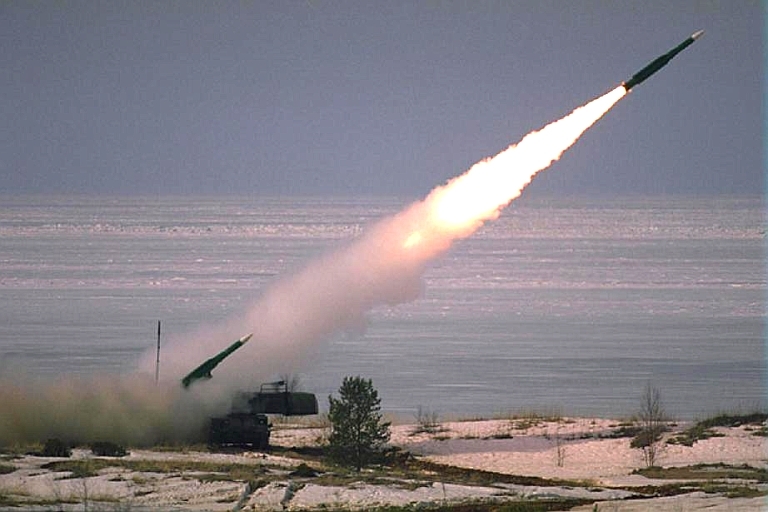 DNPP 9M317E Buk M2 Grizzly SAM. Mass 720 kg, Length 5.55 m, Diameter 0.4 m, Range ~24 nautical miles (image © Miroslav Gyűrösi). 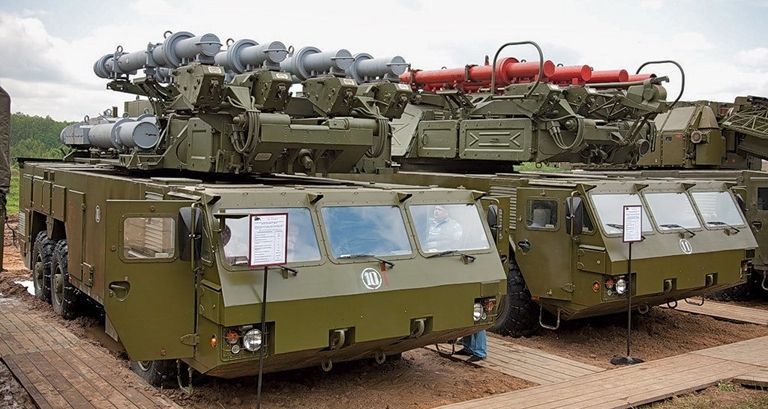 Exports of the 9K37 Buk / SA-11 Gadfly family of systems have been limited to date, largely reflecting the Soviet policy of first equipping frontline Soviet units with new equipment, then Warsaw Pact allies, and finally other client states. When the Soviet Union collapsed, Belarus, Ukraine and Russia inherited most of the existing Soviet inventory. 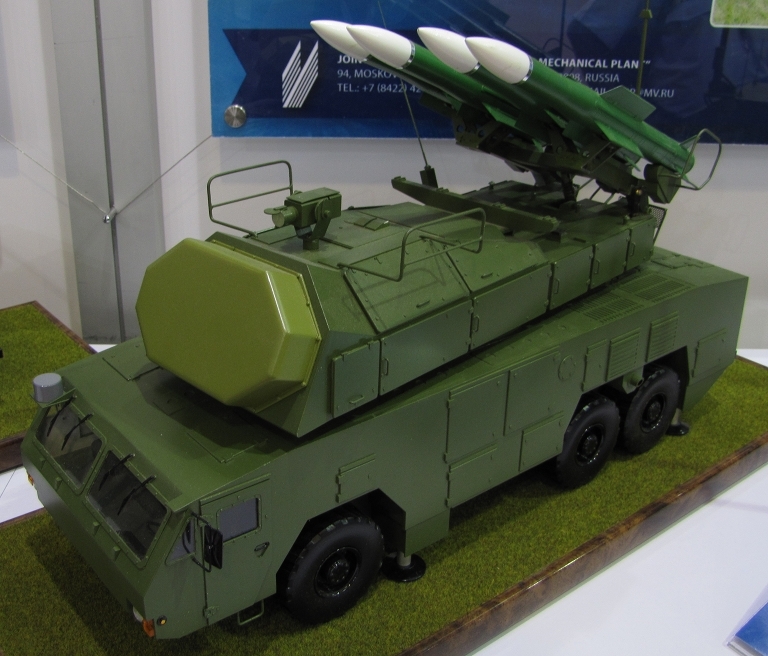 Georgian 9K37 Buk / SA-11 Gadfly batteries were credited with a kill against a Russian Tu-22M3 Backfire C in 2008. 9S35M1 Fire Dome on Finnish Buk M1 system 9A310M1 TELAR (Wikipedia images by Olli-Jukka Paloneva). 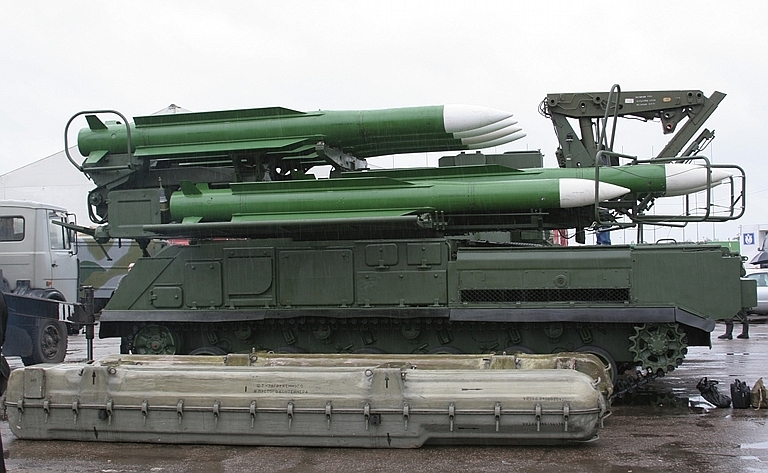 9K37M1-2 Buk M1-2 9M317E Grizzly missiles on TELAR (image © Miroslav Gyűrösi). 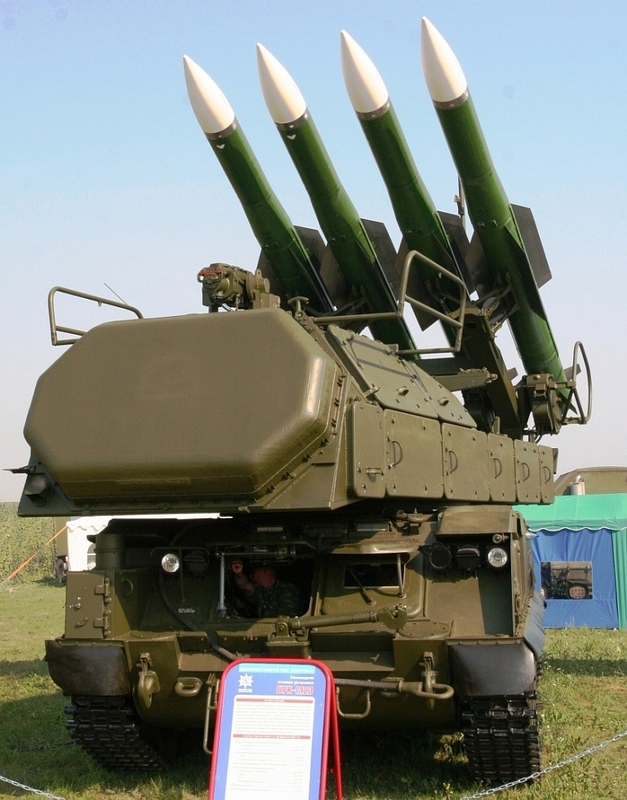 Buk M2E / SA-17 Grizzly 9A317 TELAR with new NIIP 9S36 Passive ESA Engagement Radar (image Said Aminov via Vestnik PVO). 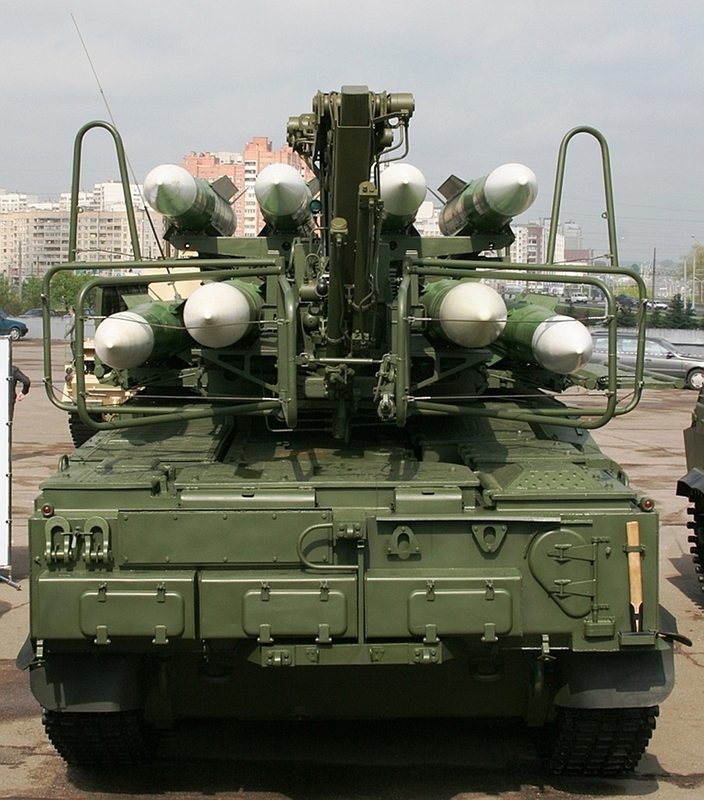 Buk M2E / SA-17 Grizzly 9A317 TELAR in stowed configuration (image Russian Internet). 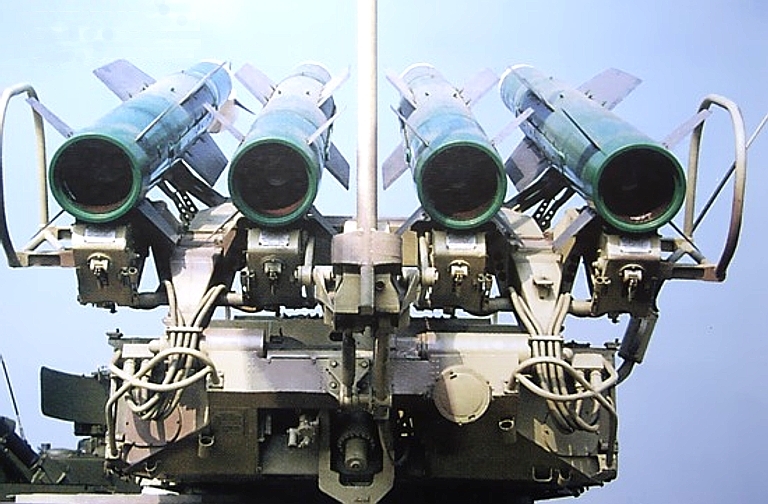 9M317 Grizzly missile rounds on the 9A317 TELAR (image © Miroslav Gyűrösi). 9A317 TELAR stations (all images © Miroslav Gyűrösi). 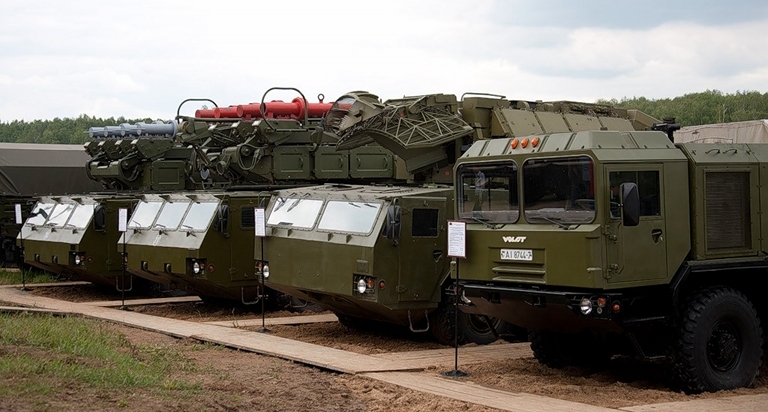 The 9A39 Gadfly/Grizzly TEL / transloader follows the model established with the S-300V system, where the transloader can fire ready rounds but is dependent on a TELAR for tracking and illumination. Four ready rounds and four reloads are carried. Depicted an upgraded digital 9A39MB (image © Miroslav Gyűrösi). Mast mounted 9S36 low altitude acquisition and engagement radar for the Buk M2E. This design supplements the Snow Drift and TELAR mounted 9S36 radars with low altitude coverage to an extended radar horizon. 9S18M1 Snow Drift (Wikipedia image). The fully mobile 9S470 series of battery command posts are integrated on the GM-579 series tracked chassis. 9K317E Buk M2E / MZKT-6922 TELAR and Transloader/Launcher prototypes at armoured vehicle proving ground open day in May, 2010 (© 2009 igor). 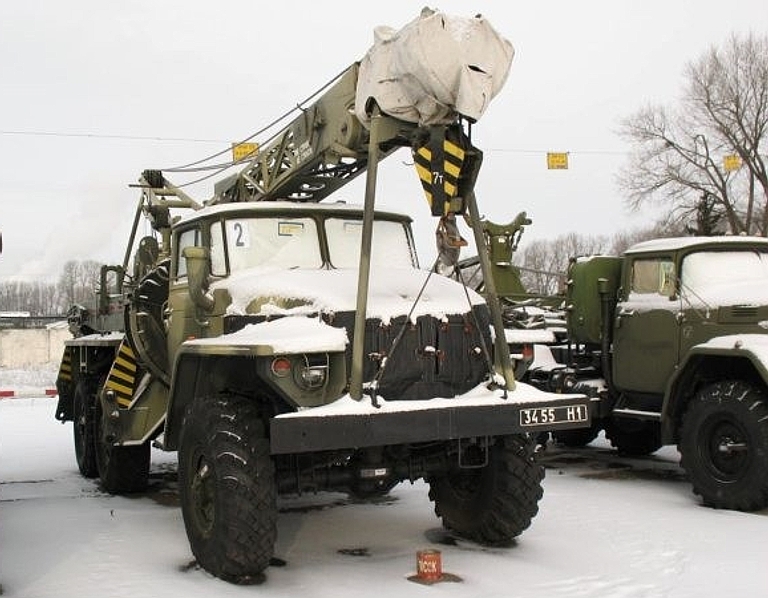 The proposal to rehost the Buk M2E / SA-17 Grizzly on a variant of the 6 x 6 MZKT-6922 chassis is intended to produce a high road mobility and low operating cost variant of the SAM system, compliant with the Russian policy change to wheeled vehicles for SAM systems. Developmental vehicles have been photographed during at least one display, but operational production hardware has yet to be photographed. The production design will be based on the later MZKT-6922 vehicle variant rather than the earlier MZKT-6922 vehicle variant used in the display models. 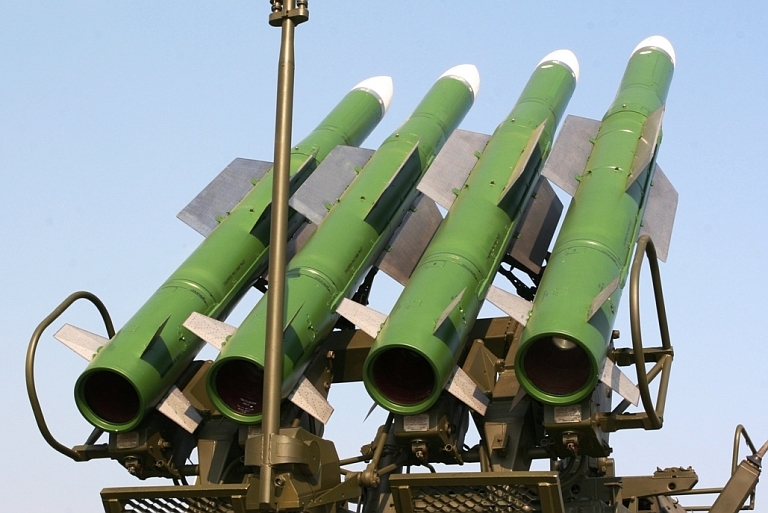 Above, below: 9K317E Buk M2E / MZKT-6922 TELAR and Transloader/Launcher prototypes. The radome indicates the prototype is fitter with an obsoleted Buk M1 / SA-17 Grizzly turret. In the foreground is a Tor M2E prototype hosted on the earlier variant of the vehicle with the two piece windscreen (© 2009 igor). 9K317E Buk M2E / MZKT-6922 TELAR model at MAKS 2009 (© 2009 Vitaliy V. Kuzmin). 9K317E Buk M2E / MZKT-6922 TELAR model at Zhuhai 2010 (© 2010 Air Power Australia via Zhenguan Studio). 9K317E Buk M2E / MZKT-6922 Transporter/Loader model at Zhuhai 2010 (© 2010 Air Power Australia via Zhenguan Studio). 9S18M1E Snow Drift hosted on the MZKT-9622 vehicle. 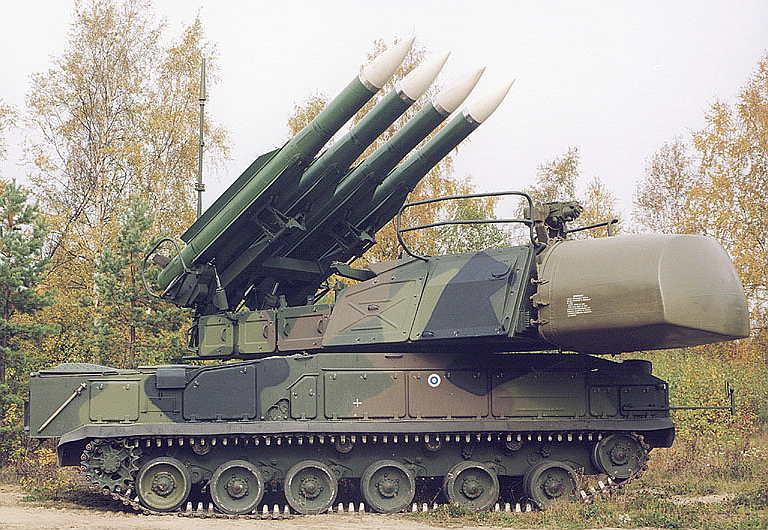 Buk M2E 9A317E TELAR with new engagement radar, hosted on MZKT-69222 vehicle. Proposed wheeled configuration of the 9S18M1E for the Buk M2E hosted on the MZKT-96222 vehicle. 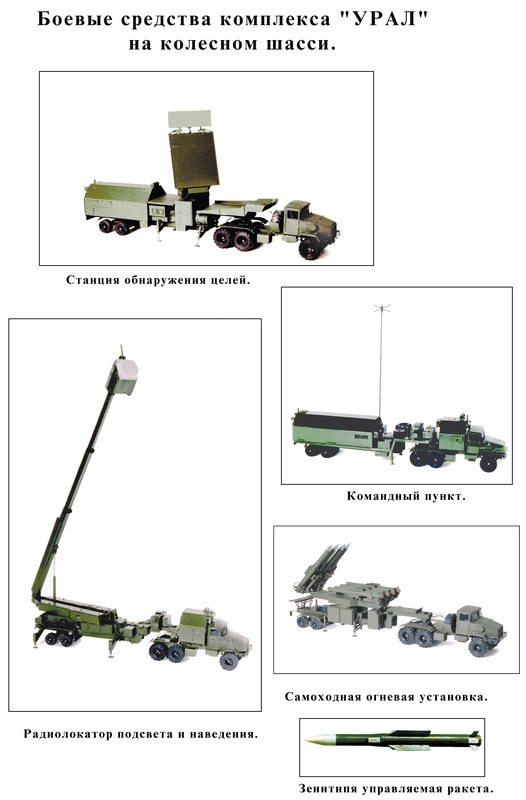 9S36 low altitude acquisition/engagement radar for the Buk M2E, carried on the MZKT-69222 wheeled chassis, stowed. 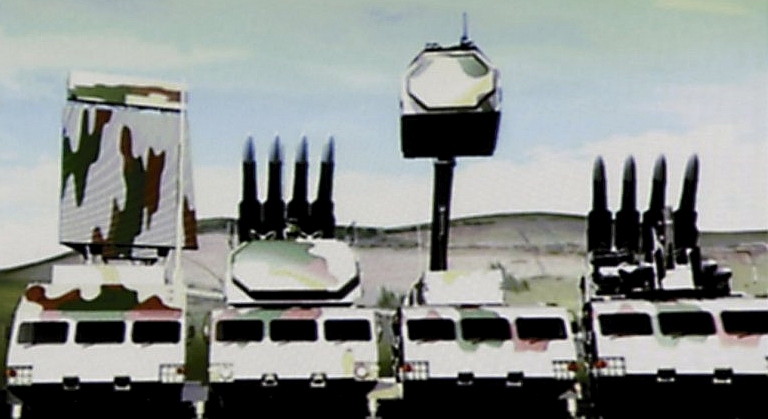 Buk M2E on MZKT-69222 chassis, left to right 9S18M1E acquisition radar, 9A317 TELAR with 9S36 engagement radar, mast mounted 9S36 acquisition/engagement radar, 9A316 TEL. 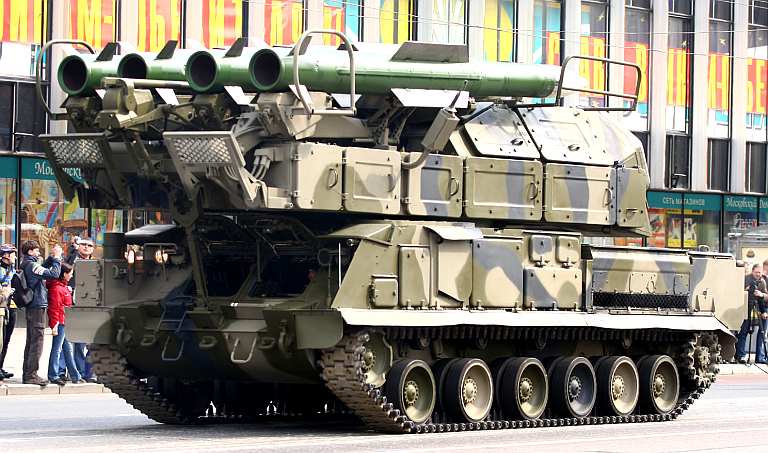 The towed configuration of the Buk M2E does not appear to have progressed to prototyping and production. 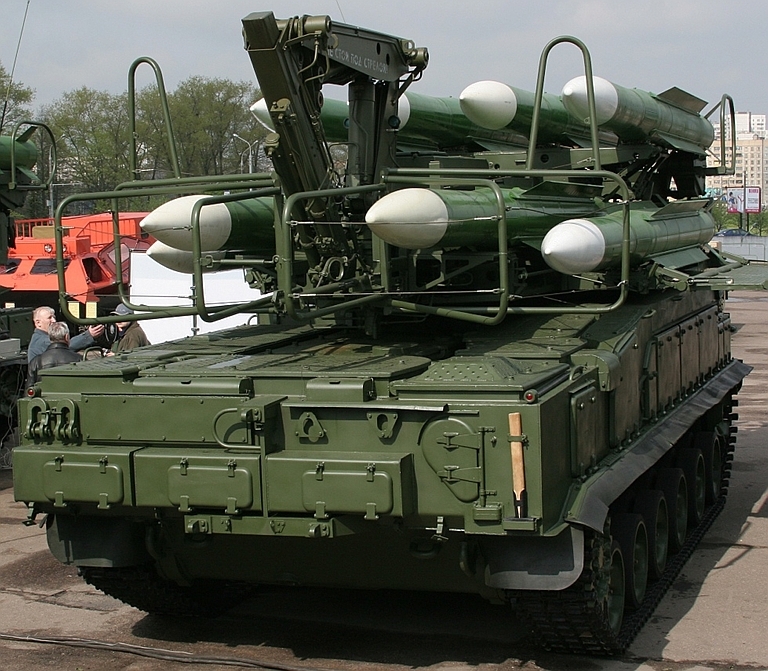 While the system is labelled as the Ural, which is a Buk M1-2 derivative for export, the inclusion of the mast mounted 9S36 acquisition/engagement radar suggests the system is the newer Buk M2E. Curiously the system includes the transloader / launcher, but not the TELAR with the autonomous engagement radar. 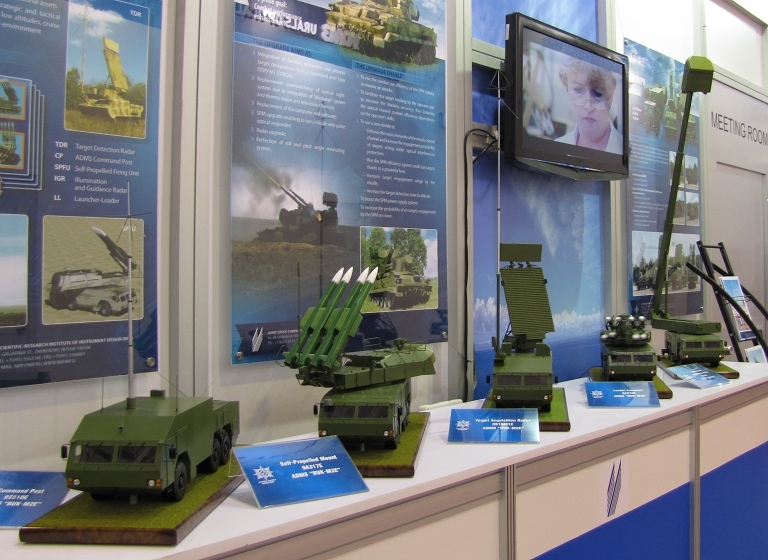 Belarus systems integrator GNPO Agat displayed the 9K37MB Buk MB system at the Milex 2005 exhibition. 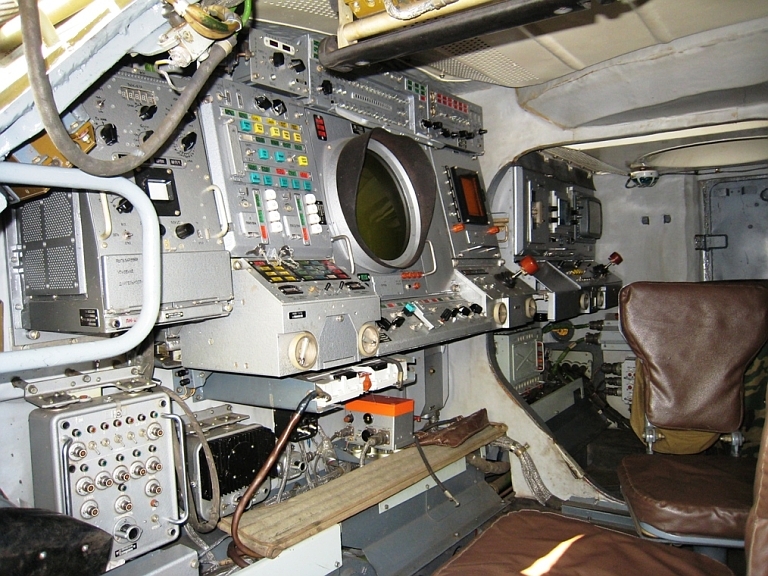 The Buk MB is a digital systems retrofit performed on the 9K37-1/9K37M1 / SA-11 Gadfly, replacing the 1980s technology systems in the 9S470 command post, the 9A39 TEL/TL and 9A310 TELAR, and relifing other system components. The upgraded system components have been designated the 9S470MB, 9A39MB and 9A310MB. 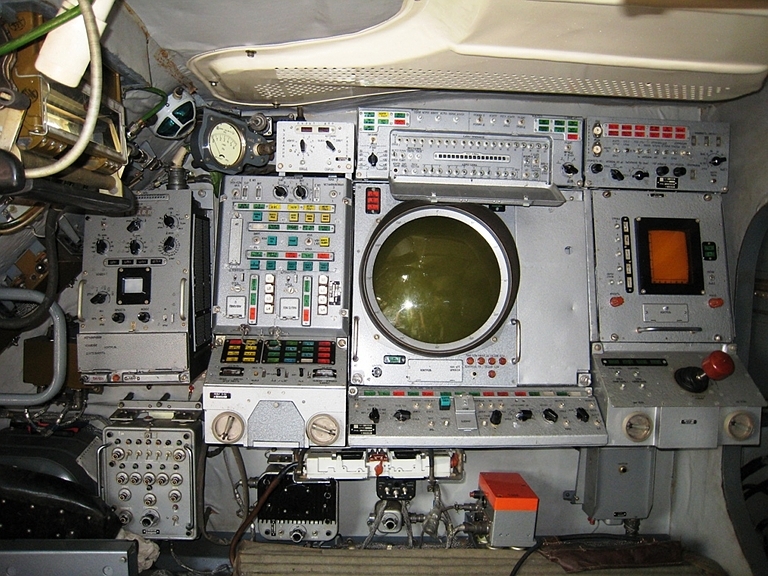 The Soviet era CRT displays have been replaced with LCD panels, a laser rangefinder has been added to the 9Sh38-3 EO system to provide range known firing solutions, and the fully digital command post has been more tightly integrated with the Agat 9S52M1RB Polyana DM sector command post. 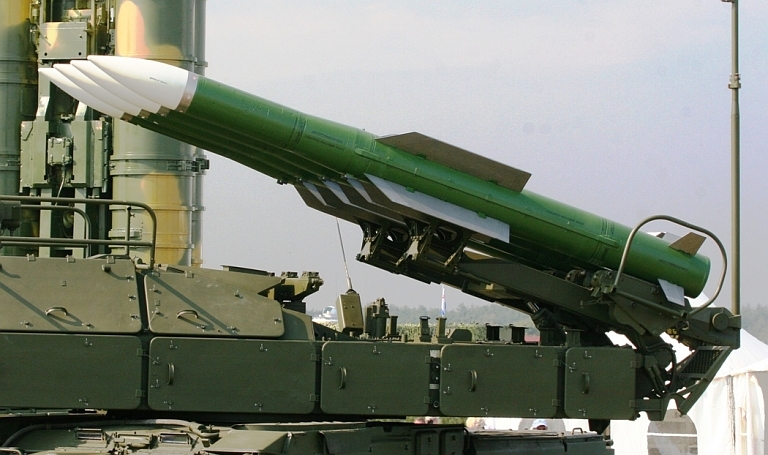 Miroslav Gyurosi "Belarus displays upgraded Buk-MB system". JANE'S MISSILES AND ROCKETS - SEPTEMBER 01, 2005. День Военного Автомобилиста на бронницком полигоне,юбилей: 100лет!! !, 31st May, 2010, URI: http://igor113.livejournal.com/77878.html.